Thirty-fifth km from Perugia and 148 from Rome, in the heart of Umbria, this is Bevanga, classic small town of 4600 inhabitants of the Valle Umbra. Probably Etruscan origin, Bevagna is contemporary in Rome (then called Mevania was probably the name of a noble Etruscan local). And traces of ancient Rome in Bevagna there are still many. 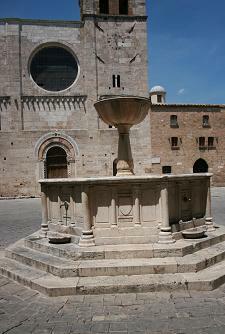 In addition to the general structure of the city, which has developed around the cardo and the decumano of the settlement, still the Roman baths, decorated with splendid mosaics, an amphitheater, which were built medieval houses, a column which is shown if the center of the main square and some architectural remains in the city churches. Bevagna was once known for the production of valuable paintings, called "Bevagna". Bevagna today is known for its evocation of the medieval Market Gaite, which takes place every year in June and attracts many Italian and foreign tourists. Umbria recommend a farm to enjoy the event. Bevagna offers a wide choice of accommodation to its guests. Go to Sections to Eat and Sleep in Bevagna Bevagna on this site to discover all the farm in Bevagna. Choose a relaxing holiday in a farmhouse in umbria a few steps away from the cities of art in the city Perugia, Montefalco, Assisi, Spello, Foligno, Terni, Deruta, Spoleto, Todi and Orvieto. Bevagna today is known for its evocation of medieval Gaite, which takes place every year in June and attracts many tourists, Italians and foreigners.